I find it impressive when a musician can venture outside of their band and can create something unique and just as compelling. 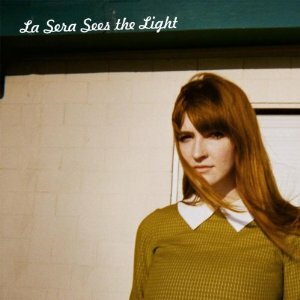 That is exactly what Katy Goodman’s side project, La Sera, is doing with the release of her sophomore album Sees The Light. The album starts off with “Love That’s Gone,” which is a mellow tune with a steady drum beat and Goodman’s harmonizing voice all over it. One would think that the first track would set the pace for the entire album, but then “Please Be My Third Eye” throws the listener into high gear. The track has a pop punk vibe to it, think a sunnier and poppier Vivian Girls (in which Katy Goodman plays bass for). When I use the word pop with punk, I’m thinking infectious catchy pop, not Yellowcard or New Found Glory pop. The rest of the album is a mix of midtempo/more punk-oriented songs with the slower tracks sprinkled in between. “Real Boy” is a song that stands out the most from the rest, blending her comforting vocals over a track that has an island vibe to it. The album follows a break-up theme with track titles like “Break My Heart,” “It’s Over Now,” and “Don’t Stay,” Goodman offers the listener a rare glimpse into her personal thoughts and feelings. Sees The Light is a great sophomore album that offers a little something for the fan of any genre. LA SERA “PLEASE BE MY THIRD EYE” DIR BY VICE COOLER from Vice Cooler on Vimeo.